The first match of the year was on the Isle and I drew a peg at Ilford, a fairly non descript straight just up from peg 55 (The Xmas Peg), as I was setting up, Scotty Russell walked by (he used to fish the river a lot back then) and said there was a shoal of big roach in my swim which showed occasionally but you’d normally only get a few before they dropped down the swim and out of reach round the corner. I set up a Daiwa Cavalier tip rod to fish bread flake just up from the bend and also a 12 foot float rod for the waggler. Back in those days, a lot of people started on bread looking for a bonus chub and on the whistle that was exactly what I did, I cast the bomb out, it went straight round an overhanging branch and I lost the lot – great start! I chucked that rod up the bank, cast out the waggler and turned round to do something and when I looked back the float was nowhere to be seen, thinking it had dragged under, I went to reel in, only for it to be solid, snagged I thought, but then there was the unmistakable thump, thump of a big roach on the other end. Slowly but surely I eased the fish upstream and slipped the net under a big roach around the pound mark – I take it back, it wasn’t a great start, it was a fantastic start! Next chuck I had another and then another, these were lovely roach in mint condition, the bites kept coming and the roach were getting bigger with some well over a pound and a half, maybe even approaching the 2lb mark. With Scott’s words ringing in my ears, I was expecting every bite to be my last but the fish kept on coming. I bumped a few fish and after a couple of hours, a big resident pike also made its presence known which didn’t do me any favours when it took some nice fish off the hook. With about an hour and a half left, I had around 25 roach but bites tailed off and I added very little to the net over the remainder of the match. At the end of the match, I didn’t know what weight I had, only that it would be my best catch on the river in a match. I think it was Mark Chapman that arrived with the scales and after three weighs, he called my weight at 21lb 5oz which I’m pretty sure was a new match record and certainly the first time over 20lb was caught on the river in a club match, what a days fishing! It was also the New Years Shield and the first time I’d won that trophy. If Carlsberg did matches…….. Elsewhere I was still fishing the canal quite a bit and I also fished the small pond at Howley for the first time and had a lovely day catching skimmers, crucians, small tench and perch and roach. I remember getting a few on a little waggler before switching to the pole and catching really well, what were tentative bites on the waggler became unmissable using a much lighter float with the pole and if I were to pinpoint a moment when I saw the real worth of the pole, this was it and a love affair was born! For the next few years my record keeping became almost non-existent and there are virtually no photos or newspaper clippings so this will be rather brief as it relies on my memory banks. 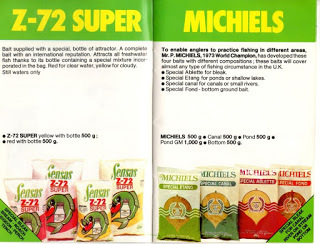 It was around this time that A + R Tackle closed its doors for the last time and I started buying my bait from Chard Angling Centre which was on my way home from work. I soon found myself fishing some of the Chard matches on their stretch of the Isle as well as Chard Reservoir, Howley, Sadborow along with regular trips to Crockerton. 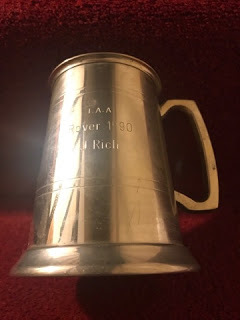 I did find this nice tankard for winning the rover in 1990, I’m not overly sure about the details, I seem to recall I had 8lb something on the Isle but not sure which swim I picked. Rovers were funny matches really, you picked a number and if you had first choice you could chose any swim between two pre determined points (for example Upper and Lower Coxes) but after an hour you could move to another vacant swim if you so wished. Rover style matches are still quite popular but they tend to be more draw and choose and you stay on the peg you’ve picked. I’m pretty sure it was the only time I won the rover and it was around this time that IAA stopped fishing for trophies so no more presentation evenings which was a shame. (I might have a dig around in the loft to see if I can find anymore nice trophies). Chard AC also held several matches at Ash Ponds and if I’m honest I struggled, back when Ilminster used to fish it, the matches were normally won with bigger fish, skimmers, tench and the odd carp but now the Chard boys were fishing whips and catching loads of small fish, people like Les Braunton, Dave Lawrence, Jack Symonds and Steve Bishop used to win a lot of the matches. I’d bought a Daiwa Champion-50 5 metre whip, it was telescopic but if I wanted to fish it at shorter lengths, I just slid a section out! If I’m honest, although I didn’t disgrace myself at Ash, I was always a few pounds off the pace but then one day Baz Morgan offered to help. 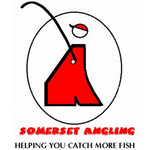 Baz owned Langport Angling Centre and was great friends with Chris Patten who used to fish the Ilminster matches so we used to go over occasionally and he offered me some advice on feeding and said the key was to feed slop and keep a cloud in the water, he even said he’d sort me out with some special groundbait. So before the next match at Ash I went to see Baz who gave me this ‘special’ groundbait in a plain bag with instructions to mix it wet so there was an inch of water on top, I finished third in the next match and then Chard held an open competition which I won with 9lb of small fish and picked up £100. Sadly we stopped fishing it not long after that but years later I spoke to Baz about that ‘special’ groundbait and if I remember correctly he said it was Sensas Z-72 (the yellow one that came with a little bottle of additive) that he just put in a plain bag. It might have been something else like Record 515 but whatever it was it gave me confidence and made me feel like I had the edge over the opposition. 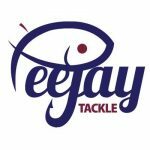 There were also some trips to the Wembley Stadium of match fishing, the Warwickshire Avon at Evesham with Les, Max (Mark Nicholas) and Chris Patten. After reading about it every week in the angling press I would now be fishing those hallowed waters and if I’m honest and you’ll excuse the pun, I was out of my depth! The first match I fished was on a Wednesday so I phoned Chris, who had fished it before, for any advice on how I should approach my first visit. Chris, being the top bloke he was, invited me round for a chat. He showed me how he modified his maggot feeders by replacing the link with power gum and also how he camouflaged them using a black marker pen. He showed me how to tie the feeder rig so it was in a big loop with several smaller loops to form a boom to keep the hooklength proud of the feeder and gave me loads of invaluable nuggets of info. Memories of the journey up (possibly with us all in Max’s transit van) are pretty hazy as are details of where the draw was (possibly in the café by the ferry? ), but I drew a peg and I think it was A7 and as I walked back along the anglers waiting to draw, the locals were saying I was on a flier, one of the best pegs on the stretch, not too much pressure then! The peg didn’t look anything special with a few trees on the far bank and Chris happened to be on the peg above me, I set up a waggler and a maggot feeder, it was pretty cold and we were stood in the water which was fairly deep and lapped at the top of my waders, every time I moved, a little bit of water went over the top and in no time my feet were like blocks of ice. I started on the waggler but it was racing through and I just knew it wasn’t right, that rod was chucked up the bank and out went the feeder. I fed out a bow of line as instructed by Chris and waited for drop back bites. I was soon getting indications and my first fish was a gudgeon, not the target species but at least I hadn’t blanked. I then hooked a good fish which was a chub around 2lb and then snapped off on one when I struck! I added another of the same sort of size but then bites slowed, I started trying some of the little tricks that Chris had told me about like only half filling the feeder and casting further down the peg. I then hooked another chub, this was a better fish and these were very wise, cute fish that got fished for three or four times a week and they knew every trick in the book. It came in fairly easily and I could see the fish and just as I was about to reach for my landing net, it savagely shook its head and snapped the 1.7lb Bayer Perlon hooklength like cotton before giving me a look of utter contempt and heading back to its mates to tell them about the muppet from Somerset who was cocking up a flier! Bites then understandably slowed right up so with my feet freezing cold, I walked up to see how Chris was getting on, one of regulars was coming the other way and I said hello and he replied saying he couldn’t believe I was walking when I was winning the match! Chris hadn’t had much and said I should just stick at it and hope for another couple of bites, I went back and the rest had obviously done it some good as I had a decent roach nearly straight away but that was it. Time was ticking by and then a savage bite resulted in a big fish taking off downstream, with a fairly light hooklength on, there was nothing I could do so just had to let it go, it eventually stopped just above the next anglers peg and I started to gain a bit of line back. It was obviously a big fish but I didn’t have a clue what it was, big chub, barbel, carp or even a salmon, I really didn’t know, it might even have been foulhooked. I was slowly getting the upper hand and Chris came and sat behind me, the fish was on the inside and just when I thought I had a chance, it went again and snapped the hooklength – I was seriously gutted as I knew I’d just lost the match winning fish. I don’t think I had another fish and at the weigh in, my two chub, a roach and a few bits went 4lb 14oz which was enough for third place and a nice pick up of £75 but I’d had enough on the hook to win, not once, not twice but three times! I did go up once more and this time the river was in flood, I don’t remember too many details other than the only steadier water was on the inside and I managed a decent roach on the lead but that was about it. I know Les did win a match with double figures and it might have been this one and I think he had a bream in his catch but whatever it was a fantastic result in such a high class field. Chard Angling Centre had a shop team with all the ‘sponsored’ anglers having some really nice waterproof jackets emblazoned with ‘Chard Angling Centre Team Daiwa’ in gold lettering and after a string of decent results I was finally presented with a coveted jacket and invited into the inner sanctum. Not long after, Chard and Ilminster clubs held their first joint open using both clubs stretches of the Isle and I drew peg 26 which is known as ‘The Foxhole’, a brilliant swim and I caught fish all day on the pole, mainly dace and when the scales reached me, the top weight was the legend that is Malcolm Levy with 12lb 8oz, I plonked my fish in the weigh sling and my weight was called out exactly the same so we ended up joint winners and I picked up £115 for my first open win on the river. Like most clubs, Chard had it’s fair share of characters, there was Basher, Ollie, Wally, Bish, Bushy, Butch, Rocking and Janders (sounds like something out of Snow White!). I still see quite a few of them but some don’t fish anymore and sadly we have lost a few along the way like Jack Symonds and Dave Lawrence who passed away this year. Next up – Part 8 takes a look back at 1993.